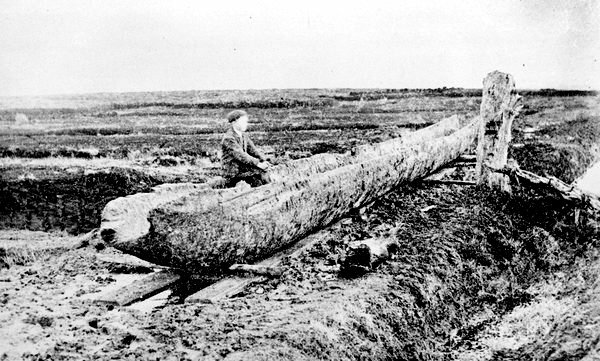 This is the story of the 50 foot long Dug-out Canoe found at Lurgan Bog in 1902 and since estimated to have been been made around 2000 B.C. which places it in the early Bronze Age. It was first uncovered by Mr. Pat Coen whose grandson Paddy now live on the family farm at Rosmearin. 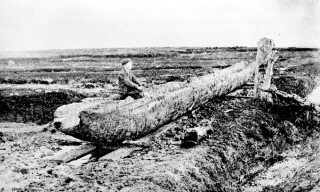 Early in 1902 some workmen who were making a drain in a bog in the Townland of Lurgan, Parish of Addergoole (Milltown), came upon what they considered to be two ordinary pieces of bog wood at a short distance from each other and only a few inches from the bottom of the drain. They cut away sufficient of the timber to make the bottom of the drain level and thought no more about the matter till August when Mr. Pat Coen who owned the bog was sinking the drain deeper; on coming to the bog wood he was astonished to find that it was part of something which he thought resembled a coffin. On clearing the mud on it he found it was a dug-out canoe lying in the bog substance at a depth of at least eight feet below the present level of the bog. He reported his find, and after considerable correspondence Father Kelly of Milltown brought the matter under the notice of Sir Thos. Esmoncle, who visited the place and purchased the canoe for the R.I. Academy from Mr. Coen for £25. The landlord, Mr. Golding of Derryormonde, having kindly waived any rights he had in favour of the Academy. The Museum authorities in Dublin sent down a staff of workmen after Christmas and with great difficulty the boat was hauled through the rain-sodden bog and brought to Milltown Railway Station. 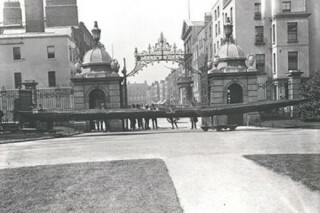 It left Tuam on January 20th on its last voyage, safely loaded on three large railway wagons, and arrived in due course at the museum where it underwent a preserving process. The canoe when first found was as white and as fresh as when in use; but it got very brown and more the colour of the bog material after a short exposure to the air. It is 50 ft. in length and tapers from a few feet from the bow to the stern; at its widest part it is 3 ft. 8 in., and about 30 in. in depth. It is of-course formed from the hollowed out trunk of a single tree. On the bottom inside there runs a moulding ( a couple of inches wide) from stern to stern. This moulding had cross branches running up to the gunwale in 4 or 5 places, probably where the rowers sat, and here also the gunwhale on both sides was pierced through transversely by holes of about 1.iinch diameter. This is by far the largest canoe of its class that has so far been obtained by the Museum, and is a perfect specimen; the men in the first instance having fortunately only cut away the gunwale on each side for about a foot to the depth of two inches near the middle of the boat. There is no lake that would float such a boat within a few miles of the place where it was found; and the exact spot is IIy 30 ft. higher than the stream at Knock from which it is about 300 yards distant. This river was deepened a few feet in connection with the drainage of the river Clare about 50 years ago. Footnote: Paddy Coen tells us that the local men employed to get the canoe out of the bog and over to Milltown Railway Station were paid a small fee plus a barrel of Guinness per day. No doubt it is just sheer co-incidence that it took over three weeks to reach the station. 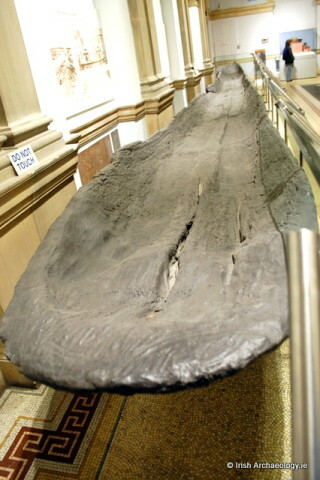 The canoe can, of course, still be seen at the National Museum of Ireland in Dublin. This page was added on 14/01/2015.